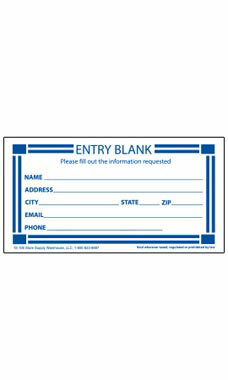 Compliment your ballot boxes with these corresponding Contest Entry Blanks! These are necessary for any professional contest or promotional giveaway that will impress your customers! All your customers have to do is fill in the appropriate fields and place their entry in your ballot box. Your contest is sure to create excitement among them! In stock at all of our four warehouses and available for immediate shipment to you. This is a great product. The only thing is when you look at it you don't see a place for e-mail so I thought I would have to write it on there. To my surprise when they arrived there is a line that says e-mail at the bottom. It had a line for email address! Come on, your #1 marketing tool today is collecting emails! Very easy to use form to collect customer contact information. We used the entry blanks to capture potential customer information at an open house event recently. We gave away a $90 valued item which gained us many leads.